The Nicobar pigeon (Caloenas nicobarica) belongs to the family of doves and pigeons, Columbidae. The Nicobar pigeon species is distributed in India (Andaman and Nicobar Islands), southeast Asia, New Guinea, Solomon Islands and Palau islands. Vagrant pigeons have been observed in Australia. These pigeons are polytypic species. The Nicobar pigeon (Caloenas nicobarica) is a large, stocky pigeon, measuring 30 to 40 cm in length and weighing 460 to 600 grams. 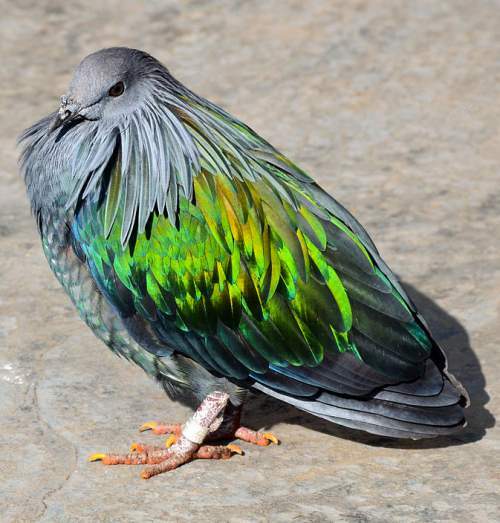 The adult Nicobar pigeons have dark gray head and neck. They have long fowl-like green and copper hackles on the neck. The wings and the back are metallic green and copper. The short tail is white. The rest of the plumage is gray. The bill is gray and the cere forms a small blackish knob. The irises are dark. The legs are dull red. In females, the hackles are shorter and the underparts are browner. Their call is a harsh guttural croak or barking sound. The Nicobar pigeon species are distributed in India (Andaman and Nicobar Islands), southeast Asia, New Guinea, Solomon Islands and Palau islands. The subspecies C. n. pelewensis is distributed in Palau islands. The pigeon nominate subspecies C. n. nicobarica are distributed in India (Andaman and Nicobar Islands), Myanmar, Thailand, Cambodia, Vietnam, Malaysia, Indonesia, Philippines, Solomon Islands and Papua New Guinea. 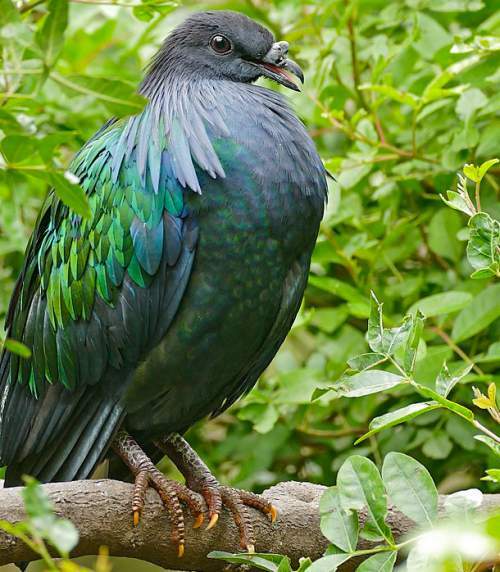 These Nicobar pigeon species have moderate forest dependence. They normally occur in altitudes from 0 to 700 meters. The artificial ecosystems of these species include agricultural fields and orchards. The natural ecosystems and habitats of these pigeon species include, tropical and subtropical dry forests, moist lowland forests, dry shrublands, moist shrublands and wooded islands. The diet of these pigeons consists mainly of seeds and fruits. Berries, wild fruits, orchard fruits, grains, seeds, buds and other plant material are their primary food. The breeding season of the Nicobar pigeon species appears to be prolonged. Starting in June, nesting birds are observed even in January. These birds are monogamous and breed in dense colonies. The nesting sites are located in dense forests on small, offshore islands. The nest is a flimsy platform of sticks and twigs, built on the forks of tree branches. The typical clutch contains one elliptical very pale blue egg. These Nicobar pigeon species are non-migratory birds. The breeding populations prefer dense forests on small offshore islands. They make nomadic movements in search of food and forage in larger islands and mainlands. Post breeding, the juvenile pigeons may disperse and establish in new locations within the range. They may make local movements for feeding and breeding within their range. The global population size of the Nicobar pigeon (Caloenas nicobarica) has not been quantified. The overall population trend of the species is considered to be decreasing. Throughout its range, this species is reported to be generally scarce to rare. The generation length is 6.6 years. Its distribution size is about 16,200,000 sq.km. Habitat alteration and destruction, hunting, deforestation and capture for pet-trade are the main threats that are endangering the survival of this pigeon species. The Nicobar pigeon (Caloenas nicobarica) is approaching the thresholds for being Vulnerable under the range size criterion, under the population trend criterion and under the population size criterion. The IUCN (International Union for Conservation of Nature) has categorized and evaluated the pigeon species and has listed it as "Near Threatened". 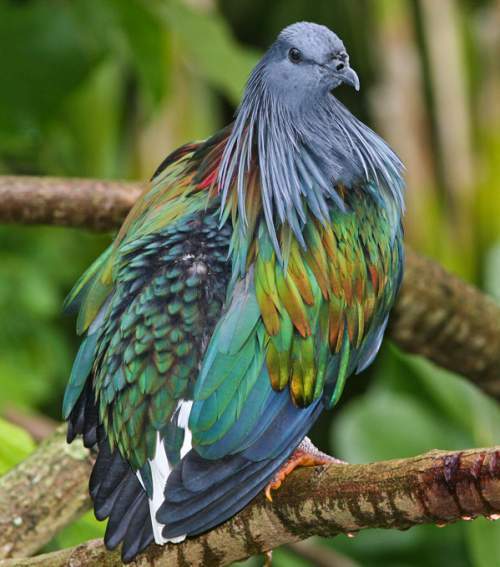 The CITES (Convention on International Trade in Endangered Species of Wild Fauna and Flora) status is ‘Evaluated’ for Nicobar pigeon (Caloenas nicobarica) and listed in Appendix I. The Nicobar pigeon (Caloenas nicobarica) is closely related to the extinct kanaka pigeon (Caloenas canacorum) and spotted green pigeon (Caloenas maculata). The two recognized subspecies of this pigeon are: Caloenas nicobarica nicobarica (Linnaeus, 1758) and Caloenas nicobarica pelewensis Finsch, 1875. Current topic in Birds of India: Nicobar pigeon - Caloenas nicobarica.